A king of rivers, the Nile is the cradle of the Egyptian civilisation and one of the world’s greatest rivers, with a length of 6,700 km. What is less known is that 90% of its resources come from Ethiopia and that it crosses 11 countries of East Africa! As for myself, I’m proud to be its eastern branch and to contribute most of its discharge. My name? the Blue Nile. You might be asking, Why blue? Well, it’s because of the silt which give me this particular dark hue, in contrast to the other tributary, the White Nile with its clearer waters. Together, we form the Nile when converging at Khartoum, after which the river continues its course through Sudan and then Egypt before flowing into the Mediterranean Sea north of Cairo. Without this river which irrigates the land so generously, Egypt would be nothing but a huge desert. This country is a “gift of the Nile”, wrote Herodotus the Greek historian as far back as the 5th century BC: 90% of its water resources come from the river. That’s why water resources have always been a keystone of Egyptian development policies. However, the growing claims of the countries upstream, in particular at my perimeter now radically transform the region’s geopolitical balance. The Blue Nile, although not as long, supplies 80% of the water that slakes the thirst of the countries downstream. 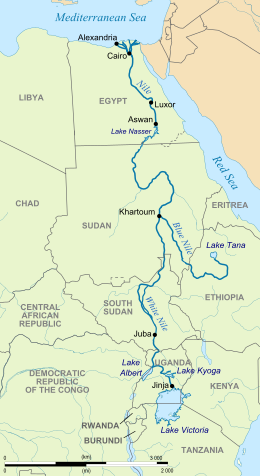 Tributaries: more than 28 in Ethiopia/ the Dinder in Sudan. It was Pedro Paez, a Spanish Jesuit priest, who was the first to discover my source in 1613. From that date, several explorers attempted to follow my course, but it wasn’t until 1968, at the request of the Emperor Haile Selassie, that a team of 60 British and Ethiopian soldiers and scientists, traced my source from Lake Tana to the Sudanese border. I am a river still tied to age-old practices (mainly agricultural) and many myths and religious customs. But I, “Abay”, or “Dark Nile”, as the Ethiopians call me, am a strategic resource. From time immemorial for Egypt and now for Ethiopia, which has become a regional power. This country claims a fairer share of my blue gold to consolidate its development. With another tributary of the Nile, the Atbara, we spring from the high plateaux of Ethiopia and are the two main reasons for the annual summer floods. Since antiquity, I have given rhythm to the lives of the neighbouring populations and the harvests… Indeed, the silt carried by my floods guarantees the fertility of the surrounding land. Farming still makes up 40% of the country’s GNP and provides 80% of its jobs. The great majority of the population lives in the countryside and depends on family farming. But there lies the paradox: this country, the water tower of Africa, is regularly confronted by droughts and the famines that result from them. Eight to nine million people suffer from malnutrition, and when droughts occur, as in 2016, this number can reach 20 million. The reason for this is that only 3% of the 3.7 million hectares of farmland are irrigated. Not only must the irrigated area be enlarged but farming practices must be modernised to feed the growing population and stem the rural exodus. Ethiopia has Africa’s second largest population, with more than 90 million people, though it remains one of the world’s poorest countries. Exploiting its immense energy potential has become an urgent priority for the government in Addis Ababa. The country has a hydroelectricity potential of 45,000 MW though only 5% is currently harnessed, i.e. 2,250 MW. The Ethiopian plans to raise the national electricity capacity to more than 17,300 MW from now to 2021. To achieve this ambition, the country is counting on the Grand Renaissance Dam to generate an additional 6,000 MW (read boxed text) and export it to its immediate neighbours, namely Egypt, Sudan, Djibouti and Kenya. The dams of Roseires and Sennar, which already lie astride my course, are vital for Sudan since they produce 80% of the country’s electricity. At the beginning of the 2000s, Ethiopia launched the construction of a gigantic dam to ensure its energy independence and satisfy its development needs. It financed this investment of $4 billion on its own. The Renaissance dam built on my course is designed to produce 6,000 MW- or the equivalent of six nuclear reactors – and store nearly 70 billion cubic meters of water. 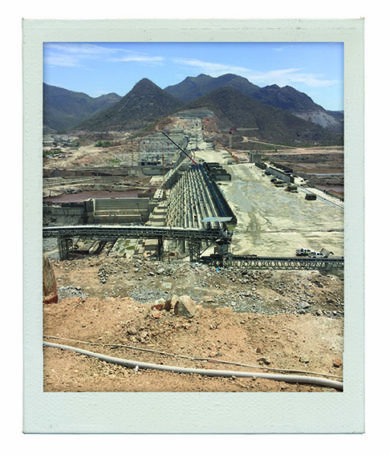 This huge structure will become the largest hydropower dam in Africa. The dam’s construction has not yet been completed but the three countries concerned – Ethiopia, Egypt and Sudan – are finding it difficult to reach an agreement over the dam’s operation and the principles underlying their cooperation. 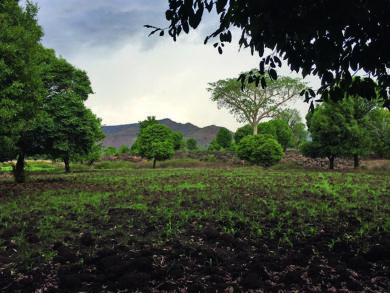 More than 75% of the Ethiopian population, mainly rural, is not connected to the electricity grid. For those who are, power cuts are frequent and long: three per month on average! According to the Ministry of Energy’s figures, Ethiopia needs to increase its electricity production by 20 to 25% a year. Although the country has waged heavily on hydroelectricity, the government is also developing wind farms and solar power plants with the aid of international funding bodies. The capital of Ethiopia, Addis Ababa, has also committed itself to reducing greenhouse gas emissions by 64% from now to 2030, notably thanks to renewable energies. 75% of the population is not yet connected to the electricity grid. Egypt takes 90% of its water for human and industrial consumption, and farm irrigation from the Nile. 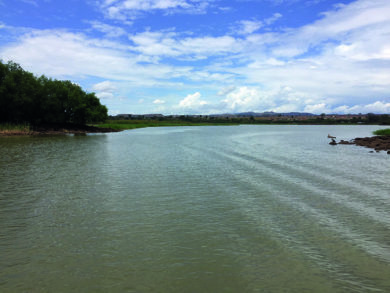 The project of its Ethiopian neighbour to build a mega-dam therefore leads it to fear a reduction of the river’s discharge and the diversion of water upstream, in particular for irrigation. Above all, it runs counter to the historic treaties governing the Nile (1929 and 1956) which protect Egypt and Sudan from any change in the discharge of the Nile and grant nearly 87% of the Nile’s discharge to these two countries. Although Egypt recognises Ethiopia’s right to development, it has engaged a diplomatic campaign against Ethiopia, which is nonetheless continuing the works. Sudan, however, is progressively aligning itself with Ethiopia. The situation is evolving slowly: a tripartite national dam committee that meets in Cairo, Khartoum and Addis-Ababa has been set up and an agreement in principle was signed in 2015 to privilege an approach of cooperation on questions of compensation and energy sales. In May 2018, Sudan, Egypt and Ethiopia concluded an agreement to set up a scientific committee to study the dam’s impact. Diplomatic action must be taken quickly to solve this conflict and determine how the Nile’s waters should be shared between the three countries. To respond to the loss of control over its water supply, Egypt is seeking alternative solutions, starting with the search for new resources. Canals have been planned in the western desert (Toshka Canal) and in the Sinai (Peace Canal). They will permit the development of 200,000 ha and 250,000 ha of farmland respectively. Egypt could also exploit the huge fossil water aquifer of the western desert, though the cost of extraction would be high. Other solutions could be considered: drop-by-drop irrigation systems, putting a price on water, etc. 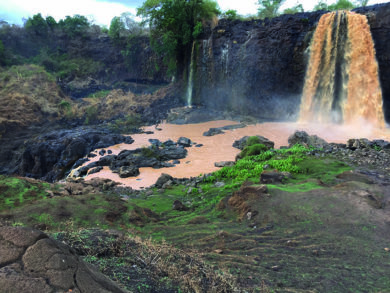 Hello, I invite you to visit the following page, on the Initiatives for the Future of Great Rivers (IFGR) website :Blue Nile https://www.initiativesrivers.org/rivers/nile/ Best regards.